CLEMSON, South Carolina — South Carolina’s position as a national leader in advanced materials just got a giant boost. A team of researchers from 10 universities across the state has received a $20 million, five-year grant from the National Science Foundation’s Established Program to Stimulate Competitive Research (EPSCoR) to establish a new initiative: Materials Assembly and Design Excellence in South Carolina, or MADE in SC. 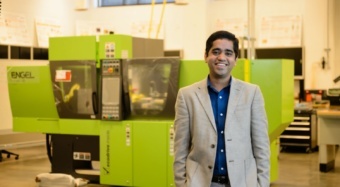 “The vision of MADE in SC is to discover and establish new and sustainable approaches for the design and assembly of advanced materials that serve South Carolina’s STEM research, education and workforce needs, and to invigorate economic development,” said Rajendra Bordia, professor and chair of the materials science and engineering department at Clemson University and the co-principal investigator and scientific director for the statewide program. Other collaborating colleges and universities are the University of South Carolina (USC), the Medical University of South Carolina, the College of Charleston, Furman University, USC Beaufort, Winthrop University, Claflin University, South Carolina State University and Florence-Darlington Technical College. Rajendra Bordia will be scientific director for MADE in SC. With the EPSCoR grant, MADE in SC is committed to hiring 17 new researchers over five years at five institutions. The universities will also invest in training postdoctoral fellows, graduate and undergraduate students; outreach to K-12 schools and the public; and developing new facilities. 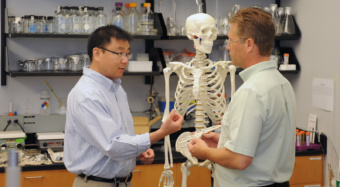 Clemson will receive $5.9 million of the grant and will hire five new faculty members, support 12 new doctoral students to work with 17 faculty members from six departments, and invest in new equipment for materials research. building infrastructure for computational modeling to accelerate materials research and development. MADE in SC underscores how important academic research is to economic development, said James P. Clements, president of Clemson University. The new EPSCoR grant will help Clemson students like computer science major Khayla Williams (left) and faculty members like Jacob Sorber, associate professor of computer science, prepare the world for the next generation of computing systems. Among the current corporations in South Carolina for which MADE in SC will provide support and future employees are AVX, BMW, Boeing, CuRE Innovations, GE, IBM, Michelin, Milliken, Poly-Med, Savannah River National Laboratory and Tetramer, Bordia said. Anand Gramopadhye, dean of Clemson’s College of Engineering, Computing and Applied Sciences, said the project will strengthen industries already in South Carolina while attracting new ones. New undergraduate degree programs at USC Beaufort and the College of Charleston and expanded curricula at Furman, Winthrop, Claflin and USC will be developed to create a new pipeline of highly skilled workers from South Carolina’s higher education institutions into the current and future thriving industries. The grant will also provide funding for summer programs to train high school teachers to deliver engaging materials science content to better prepare students for a future in advanced materials and manufacturing. This material is based upon work supported by the National Science Foundation under Grant No. 1655740. Any opinions, findings and conclusions or recommendations expressed in this material are those of the authors and do not necessarily reflect the view of the National Science Foundation.